The Borders, as readers will undoubtedly know, were an area that was much disputed in the various wars between Scotland and England, and were often a lawless place. Despite that they were the setting for a number of strikingly impressive abbeys. Unfortunately these were frequently sacked and are now mostly in ruins but they have a grandeur and beauty all of their own. The landscape is rolling and often bare hills and high moorland rising to the Cheviot Hills which straddle the border. These days there are a number of commercial conifer plantations but these do little to soften the rugged and challenging surroundings, which in the winter is often deep in snow and scoured by strong winds. Through this run a number of valleys in which nestle small towns such as Galashiels, Melrose, Selkirk and Kelso. It's a land of strong farming men whose fighting qualities are now channelled into the sport of Rugby, which has long flourished here. There are few areas where crops grow so much of the economy is based on sheep and the textiles that result from their wool. You need to be resillient to live here. From one side of the country to the other, and over this unforgiving land, runs Hadrian's Wall, one of the Roman Empire's most impressive creations. The Bing map shown here, which is currently showing the St Mary's Loch area in aerial view, can be expanded to full size and adjusted to show various views. One very useful one is the Ordnance Survey map view but this is only visible if you set your Bing settings to a UK location. Heading south from Traquair to meet the A708 from Selkirk, you come to St. Mary's Loch. 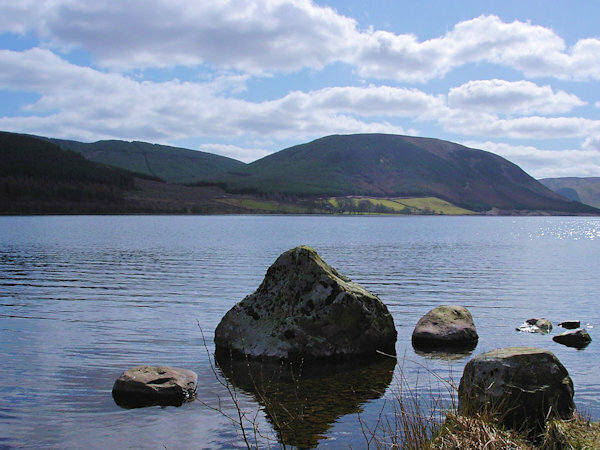 This attractive stretch of water, the largest in the Borders and nestling in a dog-leg shape amongst the surrounding hills, is associated with the meetings of the writers James Hogg and Sir Walter Scott as well as being of far more interest to us as the setting chosen by Dorothy to base the St. Marys band of mercenaries formed by Lymond. These days it hosts a popular sailing club instead. Just to the east is the valley of Yarrow where the 500 men of Lord Grey of Wilton were moving westward, plundering and burning, when intercepted and memorably routed by 20 men of Crawford and 800 sheep in steel helmets, at the beginning of Disorderly Knights. Craig Hill, down which the Scots and sheep descended, is just beyond the north-east end of the loch, adjoining the road from Traquair. The English fled southward over the Tushielaw Pass to Ettrick Water where they were ambushed by the Scotts with their German mercenaries. The area has a stark beauty but it can be a cold and unforgiving landscape, especially in the winter. Even in summer I would recommend having warm clothing as the weather can change very quickly and there is little shelter. At the southern end of the loch on a narrow strip of land between it and the adjoining Loch of the Lowes is an 18th century traditional coaching inn called Tibbie Shiel's Inn. An attractive little town, well-known to rugby enthusiasts as the birthplace of Rugby Sevens. Its beautiful ruined abbey was the setting for Will Scott's marriage. The abbey was originally founded as a Cistercian settlement by David I for the monks from Rievaulx in Yorkshire. That structure was mostly destroyed in the 14th century Wars of Independence and was rebuilt as a much more lavish structure with considerable ornamentation. This was made possible by the wealth generated by the very large flocks of sheep which were kept on the abbey's 5000 acres of land and a further 17000 acres which they leased in the surrounding hills. The heart of Robert the Bruce, which was taken to the crusades, is buried in the abbey grounds and was recently unearthed and then reinterred during work in the grounds. 14 miles south east from Melrose lies the town of Jedburgh. Again with an impressive ruined abbey, this one Augustinian, which was one of the four great abbeys founded in the 1100s. A pretty town containing another abbey, built by Benedictine monks invited by David I from Tiron Abbey in northern France. 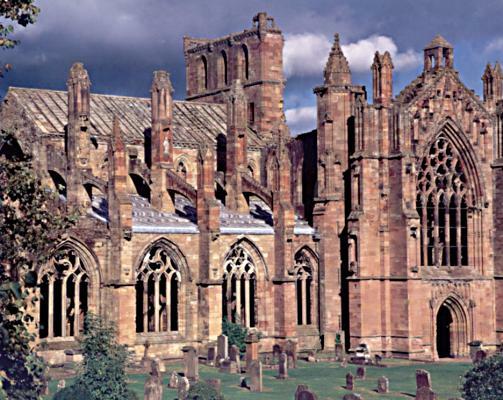 It suffered badly in successive English attacks and was largely destroyed except for the abbey church, which is one of the finest examples of Romanesque architecture in Scotland. Due south of Kelso and north east of Jedburgh lies Cessford Castle - owned by the Kerrs. Nearby is the village of Crailing where Hough Isa's house was situated. Scene of Lymond's irrespressible impersonation of a Spanish Captain while rescuing Will Scott - one of the favourite passages of all Lymond readers. A 15th century four-storey tower house, said to have inspired Sir Walter Scott, whose ancestors owned the tower. Although not mentioned in the books it is included here as it is one of the few examples of its type that is not in ruins, and gives a good idea of the sort of house used by influential people during the wars and skirmishes of its time. Home of the Scotts of Buccleuch. Not open to the public but apparently can be viewed from quite close range. The name Buccleuch, the object of much misspelling and poor pronunciation, originates from the 10th century when legend has it that King Kenneth III was hunting in a deep ravine or ‘cleuch’ in the heart of the forest, when a young buck became cornered and charged towards the unarmed King. A young man named John Scott seized the buck by the antlers and wrestled it to the ground, saving the King’s life. From that day, the Scotts were referred to as Buck Cleuch, the ‘buck from the ravine’ and were rewarded for their bravery. Once the most strategically important town on the border and a very important port, it changed hands many times. It now has some of its services run from England and some from Scotland, while the local football team is the only English team playing in the Scottish League. There are extensive and remarkably complete remains of the old fortifications and you can take the delightful walk round the top of the old town walls and visit the military museum. However there is little left of Berwick Castle and the railway runs through what little there is. There is also a pleasant riverside walk by the Tweed and you will often see a large flock of swans down by the old harbour near the impressive high railway viaduct which crosses the river and dominates the view, as well as providing excellent views of the town for rail passengers. Nearby to the south west is the area of Allendale, from where Austin Grey took his title of Marquis. Sadly we don't know exactly where Dorothy imagined the fictitious Flaw Valleys to be. We can surmise that it would be somewhere northeast or northwest of Hexham since it was supposedly not far from Hadrian's Wall, where Christian was fatally injured.